You’ve received the yearly notification regarding youth intake, one of the most exciting days on the Football Manager calendar, and you cannot wait to see if your youth academy has produced a gem. Each year brings with it the same feeling of anticipation, followed by either overwhelming joy or despondency. One of the first things I check when I am granted a high potential player is their personality. If they are professional you know you have a chance of guiding your youngster towards their potential. If they have an unprofessional personality then tutoring, or as of FM19 mentoring, is a must. But what happens when their personality is ambitious, sporting or loyal. How does this affect their development? Which personality is better – loyal or sporting? Which personality is worse – unambitious or disloyal? This experiment will follow nine youngsters, each with a different personality but the same potential. I will review how each youngster develops year-on-year to see how each personality affects the development and progression of the players careers. Will a disloyal player play for more clubs than an unambitious player? I genuinely have no idea and I am excited to find out! I created the nine players in the FM editor. With the help of Twitter polls we decided the players nationality, position and starting club. The players would be natural in the MC/AMC/ST positions and would be French, beginning their careers at AS Saint Etienne. In terms of what I have changed on the editor, each player has 1 unique attribute that gives them their personality. Mr Ambitious, for example, has 20 as his ambition attribute. Conversely, Mr Unambitious has 1 for his ambition attribute. Mr Professional has 20 for his professional attribute and so on. Mr Norm is the anomaly as I have not changed any of his attributes. All other attributes have been left blank, which means that when the save is loaded for the first time, the database will assign attributes to each player. All players have a current ability of 80 with the potential to reach 200, the maximum ability in Football Manager. Now, let’s get started by introducing the players. Mr Norm is our base player with no attribute changes. 5-year prediction: At 21 years of age, Mr Norm will be an important, if not key, member of the Saint-Etienne first team. He’ll be capped for the French youth teams but yet to make an appearance for the senior squad. Mr Professional has the professional attribute set at 20. 5-year prediction: Mr Professional will be the best player, in terms of current ability, of our youngsters. He will have earned a move to PSG but will be out on loan to someone like Bordeaux or even back to Saint-Etienne. Mr Unprofessional has the professional attribute set at 1. 5-year prediction: Mr Unprofessional will leave Saint-Etienne at the end of his contract and will be picked up by a recently relegated Stoke City. He will star in the Championship and attract attention from the likes of Southampton and Wolves. Mr Ambitious has the ambition attribute set to 20. 5-year prediction: Mr Ambitious will be the first to leave Saint-Etienne permanently. He will join AS Monaco and will play a key part in their title challenge with PSG. Mr Unambitious has the ambition attribute set to 1. 5-year prediction: With no real ambition for playing at the highest level, Mr Unambitious will remain with Saint-Etienne by the time he is aged 21. He will be a bit-part player in the first team squad and will have had several loan spells away from the club. Mr Loyal has a loyalty attribute of 20. 5-year prediction: Mr Loyal will join Mr Professional by signing for PSG after five years with Saint-Etienne. He will be gutted to leave his first club and he will forever be on the lookout for an opportunity to return. Mr Disloyal has his loyalty attribute set to 1. 5-year prediction: Mr Disloyal will become the second best player of this save, behind Mr Professional, and he will find himself in a foreign country by the time he is 21. Mr Sporting has an attribute of 20 in sportsmanship. 5-year prediction: Mr Sporting will still be with Saint-Etienne aged 21 having stuttered in his development. A series of injuries has seen Mr Sporting fall behind the others in terms of development. He is still better than Mr Unprofessional though! Mr Unsporting has the sportsmanship attribute set to 1. 5-year prediction: Mr Unsporting will battle it out with his fellow youngsters to find a place in the Saint-Etienne first team, but he will fail and decide to move on. Aged 21, he will be playing for Lyon. So, let’s take a look at how our youngsters have performed and developed in their first five years of football. I have given you my predictions, what are yours? Mr Norm has had a quiet first season, making eight appearances for the Saint-Etienne reserves with no real impact. He sits in eighth position when it comes to the current ability of our players. Tipped to be the best youngster of our nine, Mr Professional has had a slow start compared with his expectations. He lies in 4th place in terms of current ability. All 19 of his appearances came for the reserves. Surprisingly, Mr Unprofessional is right in the middle of our current ability league table after season one. He is one of five players to have made his first-team debut for Saint-Etienne, making one substitute appearance in the Coupe de la Ligue. Mr Ambitious tops the league as the best player in terms of current ability. He’s yet to play for the first team but he’s made a big impact in reserve team football, contributing to 9 goals in twenty appearances. Predictably, Mr Unambitious sits at the bottom of the league table with the lowest current ability of our nine players. He’s played only two games for the reserves, both coming from the bench, the equal fewest matches played of our youngsters. Mr Loyal was one of three players to start for the Saint-Etienne first team in their Coupe de la Ligue match. Sadly for Mr Loyal this was 1 of only two appearances all season, the other being a substitute appearance for the reserves. Mr Disloyal has had a very good season and sits 2nd in our league table. He started alongside Mr Loyal in the Coupe de la Ligue fixture and made 20 appearances for the reserves. Mr Sporting came off the bench to appear for the first team on one occasion. For the reserves, he started only one match and came off the bench twelve times. Placed equal second in the table is Mr Unsporting on 101 current ability. He, too, played for the first team in the cup competition and will be hoping to push forward next season and chase further appearances. Mr Norm became the sixth player to make his debut for the Saint-Etienne first team but he has had a rather disappointing second season, making only ten appearances for the reserves. Despite his lack of appearances, Mr Norm has developed well and has grown in similar stature to Mr Professional. Mr Professional, like Mr Norm, made his full debut for the Saint-Etienne first team, playing in the Coupe de la Ligue. In total, Mr Professional played twenty reserve team matches, scoring 5 and assisting 3. He currently sits in 4th position in our CA table. Mr Unprofessional has had a shocker of a second season, growing by only seven CA points. He made 6 appearances for the reserves, failing to register a goal or assist. Grenoble Foot secured the loan signing of Mr Ambitious and the youngster made 42 appearances for the club across all competitions. He contributed to twelve goals, scoring six and assisting six. Grenoble finished 15th in Ligue 2. Mr Unambitious sits comfortably at the foot of our CA table, he failed to make any appearances for the reserves this season. Like Mr Unambitious, My Loyal is struggling to make an impact in the Saint-Etienne youth setup. Mr Loyal played just seven times for the reserves and he failed to make any goal contributions. We have a league champion already! Mr Disloyal joined Ligue 2 Troyes on loan and he made 40 appearances for the club, scoring 11 goals and making 4 assists. Troyes went onto win Ligue 2, finishing two points ahead of Nimes. As a key member of the first team in his time there, Mr Disloyal will be hoping Troyes extend his loan spell. Mr Sporting improved upon his poor first season. He played 19 matches for the reserves, scoring six and assisting five. Mr Unsporting had an impressive second season and has begun to impress the Saint-Etienne first team manager who gave him his first league start for the first team to add to two cup appearances. Mr Unsporting sits ahead of Mr Professional after another season of development. Mr Norm left Saint-Etienne on loan to join Clermont Foot in Ligue 2. Across the season he made 36 appearances, scoring 4 and assisting 5. As you’ll see with a lot of our players, the main area of improvement and development for Mr Norm was his physicals. He perhaps hasn’t improved technically as much as he would have liked. Mr Professional has had the best year of our youngsters, improving his current ability by 20 points. He became an important member of the Saint-Etienne first team towards the latter stages of the season, making 12 appearances. Mentally, Mr Professional has improved significantly and this will further aid his future development. In complete contrast to his opposite, Mr Unprofessional grew by just 6 CA points, the lowest of our nine players. He played no games for the first team and was limited to reserve team football. Technically and physically, Mr Unprofessional has perhaps improved as much as Mr Norm. However, his mental attributes have hardly developed over the past few seasons. Mr Ambitious left the club on loan once more in season three, joining FC Metz in Ligue 2. He made 37 appearances, scoring 9 goals and making 3 assists. Mr Ambitious displays perhaps one of the most all-rounded development, improving dramatically in all three areas. He is labelled as a wonderkid and will surely battle it out with Mr Professional for top spot. Mr Unambitious has jumped a place in the current ability table, ahead of Mr Unprofessional, but he has had yet another poor season. He’s made just one appearance for the Saint-Etienne first team. Mr Loyal has had a good season out on loan at Ligue 2 side Clermont Foot, playing alongside Mr Norm. Mr Loyal has seen a staggering increase in his physical attributes with a +5 for agility and +6 for strength. He is still lacking in the mental side of the game but he’ll hopefully develop this as he ages. Mr Disloyal has become an important member of the Saint-Etienne first-team, making 28 appearances. Another wonderkid from this season, Mr Disloyal has developed well in all areas of the game. How long will he remain loyal to Saint-Etienne? Mr Sporting spent the year away from Saint-Etienne out on loan at Grenoble in Ligue 2. Though he played 36 games for his loan club, he struggled to develop as much as he would have liked. Mr Sporting has room to improve mentally, but he has enjoyed good development of his physicals over his first three seasons. Mr Unsporting tops the current ability table come the end of season three. He became an important player for the Saint-Etienne first season, making 21 appearances across the season. Mr Unsporting has developed the best of our nine youngsters. He has also learned the player preferred move of ‘argues with officials’ which is pleasing to see! Mr Unsporting has pipped Mr Professional to 1st place as both overtook Mr Ambitious and Mr Disloyal. At the other end of the table, Mr Unprofessional has dropped to 9th with Mr Ambitious moving up one place. I think it is fair to say that this has not been a dull and boring experiment so far as it could easily have been. Mr Professional has not gone straight to the top of the development table as expected – Mr Ambitious held 1st place for two seasons before Mr Unsporting secured 1st place for the end of season three. It has been good to see both Mr Unsporting and Mr Disloyal develop and achieve success, perhaps highlighting the lesser significance of good levels of Loyalty and Sportsmanship. Thinking about it logically this makes complete sense. An unambitious footballer wouldn’t care about reaching the very top of football and would instead settle at a more comfortable level. An unsporting or disloyal player will still aim to play at the highest level (dependent on their ambition of course). Moving forward, I can’t wait to see who will be our first transfer – and where they will go. I hope you have enjoyed this post and be sure to follow my Twitter where I am posting most of the updates as we progress through the seasons. 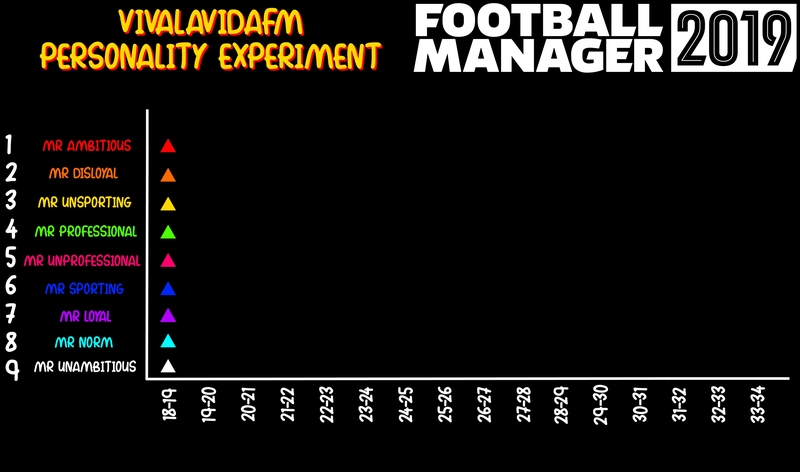 This entry was posted in FM19 Guides, Experiments & Wonderkids, Football Manager 2019, Personality Experiment | @VivaLaVidaFM and tagged ambition, FM Experiments, fm19, football manager, loyalty, sportsmanship. Bookmark the permalink.